The aim of Buchanan and Woonay's Australia at Work study is to persuade people that free labour markets drive down real wage rates because labour lacks the power to defend itself against capitalists. Yet every single critic of this so-called study missed this vital point. What we got were conservative economic illiterates like Janet Albrechtsen, Andrew Bolt and Imre Saluszinsky (all of whom are from the Murdoch stable) engaging in ad hominem attacks instead of dealing with Buchanan and Woonroy's underlying assumption that free labour markets are exploitive. 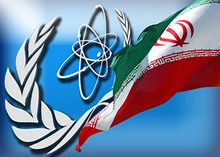 The NIE, in reality, is a final acknowledgement, and a sort of culmination, of a long trail of track-2 diplomacy and intel gathering that the US State department and intelligence agencies have been conducting, and misconducting, with their Iranian counterparts for some time now. Garry Kasparov should give up politics and do what he does best; stand-up comedy. Watching Kasparov traipse around Moscow with his basket of sour grapes and his entourage of western media-stooges is like watching "Mr. Bean's Excellent Kremlin Adventure"---a particularly lame performance in a dismal B-rated burlesque. It's painful to watch. At the time of writing this article the parliamentary elections in Russia were still some hours away, but it is most likely that “United Russia” will win by a landslide (probably receiving in excess of 63 percent of the votes). President Putin, who heads the United Russia list of candidates, has been accused of abusing his authority and taking an unfair advantage by obtaining more exposure on the state channels, and breaking up opposition rallies. Is Vladimir Putin the Worlds Most Popular Leader? On Sunday, Russians will vote in their country's parliamentary elections. The results are a foregone conclusion. Putin's party, United Russia, is expected to win in a landslide. The only question is whether the margin of victory will exceed 70%. If it does, then Putin will continue to be the most powerful player in Russian politics even after he steps down from office next year. The United States is on its way to losing the war in Afghanistan. The eventual defeat will be political not military. Public sentiment is shifting in Europe. The people have had enough. They want to get out. When European troops withdrawal from Afghanistan; NATO will gradually unravel and the Transatlantic Alliance will collapse. That will be a disaster for America. The US will again be isolated by two great oceans. But not by choice. America's days as an empire will be over. Although it is probably correct to point to rising interest rates and Howard?s admission that he would resign if re-elected as contributing to his defeat, it is still very likely that an autopsy will reveal that the principle cause of the Liberal Government?s demise was its grotesque mishandling of labour market reform. Trying to explain to Liberal politicians what was needed to successfully sell the benefits of free labour markets was an impossible task. Garry Kasparov, the former world chess champion, was arrested by Russian authorities on Saturday for helping to lead an unsanctioned procession of at least 1,500 people (against Russian President Vladimir Putin), he was sentenced to five days in prison. CBS's Investigative Unit wanted to do a report on the number of suicides in the military and “submitted a Freedom of Information Act request to the Department of Defense”. After 4 months they received a document which showed--that between 1995 and 2007--there were 2,200 suicides among “active duty” soldiers. Congressman Charlie Rangel recently unveiled a tax plan that Republicans estimate would raise taxes by $3.5 trillion over 10 years. Democrats questioned the math. Now, the Democrats on the Joint Economic Committee have released a report on the total costs of the military operations in Iraq and Afghanistan , including "hidden costs" such as interest on the money we're borrowing, and long term healthcare for vets. The bill comes to $3.5 trillion. Republicans are, of course, questioning the math on this item. It doesn't take a genius to figure out why the crooked Princess Ferragamo--Benazir Bhutto—has returned to Pakistan . Bhutto's been traipsing all over Washington trying to garner support from think-tank heavies and establishment powerbrokers to help her stage a political come-back in Islamabad. She even hired a high-powered public relations firm to polish her image so the media wouldn't focus too much attention on her past transgressions. Allegations of money laundering and corruption have haunted Bhutto ever since she was driven from office in 1996. Last month, General Musharraf cut a deal with Bhutto which freed her from the prospect of criminal prosecution and allowed her to return home. The arrangement ignored the judicial system entirely. The $1.5 billion that she and her husband allegedly “received in a variety of criminal enterprises” has simply disappeared down the memory hole. By August 2007, a lot of very smart people were reading the tea leaves, convinced that the upper echelons of the U.S. government had their own hidden reasons for forecasting an event even more heinous than the attacks of September 11, 2001. President George W. Bush, Vice President Richard Cheney, and Secretary of the Department of Homeland Security Michael Chertoff had been hinting that another 9/11 could be coming. According to the National Geographic, the Yellowstone caldera has been rising at a rate of approximately 3 inches every year since the middle of 2004, three times faster than any previous measurements. The Islamic Republic of Pakistan was established in August,1947 when its majority Muslim population separated from British-controlled India and became a sovereign state. Since then, the country has been plagued by wars, political instability, and a series of military coups as it continues stumbling unsuccessfully toward democracy. Nothing is built on stone. All is built on sand, but we must build as if the sand were stone. CRISTINA! CRISTINA! CRISTINA! the headlines chanted. On October 28th, Cristina Fernández de Kirchner became Argentina's newly elected President. She did so with the blessing of her husband, Nestor Kirchner… who also happens to be Argentina's outgoing President. Most people say they are ready to make personal sacrifices, including paying more for their energy, to help address climate change, according to a BBC World Service poll of 22,000 people in 21 countries. This week in our Special Outside the Box, George Friedman of Stratfor addresses what many believe to be the looming war with Iran, the potential wars' strategic futility, the underlying geopolitical implications, and the inherent threats that abound on account of Iran's defensive measures and offensive capabilities; the latter consisting of terrorist organizations that can harm US interests, be they domestic or foreign.